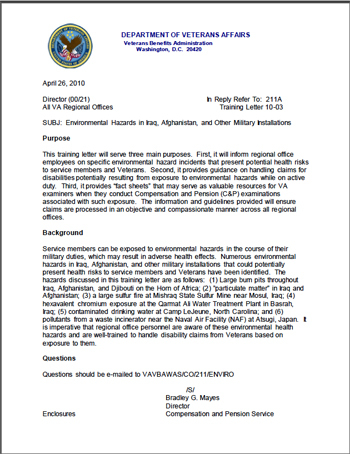 Training information and guidance on Camp Lejeune water contamination was provided by the Department of Veterans Affairs to all VA Regional Offices in 2010. It’s important for veterans and their families who were impacted by the groundwater contamination at Camp Lejeune to know how the VA is guiding its employees to handle the associated claims (aside from health care and reimbursements provided for by the Honoring America’s Veterans and Caring for Camp Lejeune Families Act of 2012). From the 1950s through the mid-1980s, persons residing or working at the U.S. Marine Corps Base at Camp Lejeune were potentially exposed to drinking water contaminated with volatile organic compounds. Two of the eight water treatment facilities supplying water to the base were contaminated by either trichlorethylene (TCE) or tetrachloroethylene (perchloroethylene, or PCE) from an off-base dry cleaning facility. The Department of Health and Human Services’ Agency for Toxic Substances and Disease Registry (ATSDR) estimated that TCE and PCE drinking water levels exceeded current standards from 1957 to 1987 and represented a public health hazard. The heavily contaminated wells were shut down in February 1985, but it is estimated that over one million individuals, including civilians and children, may have been exposed. There has been much public interest and media coverage of the potentially harmful health effects associated with the contaminated water supply at Camp Lejeune. The National Research Council of the National Academies of Science released a report in June 2009, which found that scientific evidence for any health problems from past water contamination is limited. The evidence for amounts, types, and locations of contamination were not well-recorded at the time and cannot now be extrapolated. Therefore, conclusive proof of harmful health effects is unlikely to be resolved with any future studies. Veterans may also call the Department of the Navy at (877) 261-9782. Disability claims based on exposure to contaminated water at Camp Lejeune must be handled on a case-by-case basis. Actual service at the installation during the time of water contamination must be established. The VA’s recent practice on claims related to Camp Lejeune water contamination have been consistent (case-by-case, etc.) with this guidance. However, on August 3, 2015, the VA announced it would begin the process of amending its regulations to establish presumptions of service connection for certain conditions and disabilities caused by exposure to contaminated drinking water at Camp Lejeune. You may download a copy of the Camp Lejeune Fact Sheet, which is part of the VA’s April 26, 2010 letter to its Regional Offices, here.